Before string bands were a “thing” in popular culture, there was the Hackensaw Boys. Before The Avett Brothers were selling out arenas, before Mumford & Sons were becoming the biggest band in music in a given year, before everybody and their brother was growing a beard and wearing suspenders and playing in jug bands, the Hackensaw Boys were mixing bluegrass and old time music with a punk attitude, and reshaping what a modern old school string band could sound like. Born out of the same central Virginia haunts and sidewalk busking spirit of Old Crow Medicine Show, the Hackensaw Boys hit the streets in 1999 and have since been a big inspiration to others, and a proving ground for players and offshoot projects. You may not hear their songs peppered with “ho hey!” or gratuitous hand claps as they land on the soundtrack of some hit movie or in a commercial for Aqua-Fresh, but whether the bands that came later know it or not, the Hackensaw Boys had a hand in their success by helping to break ground for string bands with punk as a major influence. The Hackensaw Boys don’t use inflected voices or the hokum that make a band like Old Crow Medicine Show such a hoot to see live. They don’t have the raw speed that the .357 String Band and Split Lip Rayfield display. They don’t have that strict adherence to the roots of the artform of The Foghorn Stringband, or the precision of so many modern bluegrass bands that are too numerous to count. They’re not the most pristine singers or apex instrumentalists. But what The Hackensaw Boys have that these others don’t is a ton of heart, and true authenticity. This is not building a string band as a skills competition or a nostalgia act; this is string band music in the raw, just like the back porch outfits from where the music was derived. It has been ten years since the Hackensaw Boys released a proper original studio album, which is a little hard to fathom until you take into account the turnover the band has experienced in the lineup. Similar to The Time Jumpers, the Hackensaw Boys are more of a collective than a band, but the constant has been guitar player and songwriter David Sickmen who’s been there from the start. Fiddle player Fred Moyse, who’s also been around for the lion’s share of that time, contributes five tracks as a songwriter to this new album as well. They’re joined for now by Jimmy Stelling on banjo, Thomas Oliver on bass, and Brian Gorby on percussion and the charismo. Yes, the charismo. 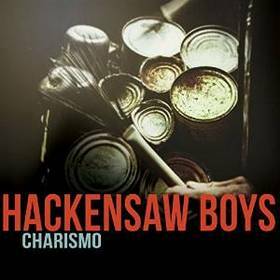 “Charismo” is not just a more masculine variation of “charisma,” or the name of the Hackensaw Boys’ new album. It is a percussion instrument derived from found objects strapped to the chest similar to a washboard. String and jug bands have been accessorizing their washboard setups for years with extra bells and whistles, but the Charismo is an animal all unto itself, with cans and other primitive noise makers extending out from it like a wearable drum set. It’s also primarily played with wire brushes instead of spoons or sticks. The charismo was first developed and named by former Hackensaw member Justin “Salvage” Neuhardt. More important than the Charismo itself, the idea of taking virtually anything and making a percussion instrument out of it has inspired countless other string bands to do the same. The presence of the charismo on stage announces to the audience that this isn’t just some contemporary bluegrass outfit, but the instrument’s primary function is not show. The charismo fulfills the same spot the snare drum did in Jimmy Martin’s bluegrass band, which is to free up the rhythm players to focus more on the melody and instrumentation instead of keeping the rhythm on the strings. The bane of modern bluegrass is the “hack” on the mandolin that is necessitated by the lack of a percussion player. By including that bit of extra character to the music, the Hackensaw Boys can do something other string bands can’t. There’s a song called “Flora” about desiring a woman that doesn’t know you exist, and the interesting perspective of “Happy For Us in the Down” about having to weather both mood swings in a relationship. The songwriting on Charismo is deeper than it first appears on the surface, and reminds you a lot of The Band or Bob Dylan, where at times it’s delightfully sloppy and humble in how it really has to work to articulate the message it wants to get across, just like all of us struggle to wrangle our emotions, and the wisdom they’re attempting to impart to us at a given moment. The Dylan, Levon Helm, blue collar attitude is also endowed on this album from the presence of the legendary Larry Campbell manning the producer helm. 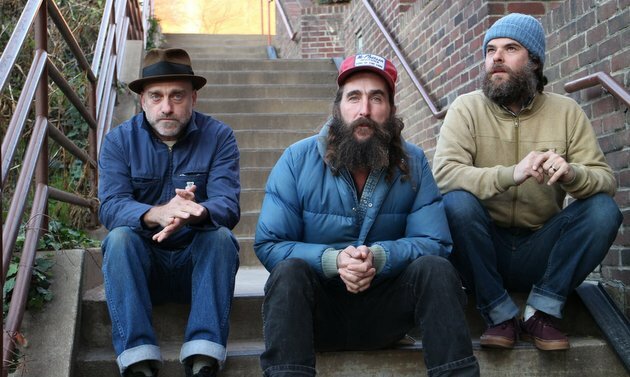 The Hackensaw Boys are not one of those bands that wow you with any one thing in particular. But they remind you of yourself, and they speak directly to your heart in how their struggles parallel your own. They’re a true working man’s band without any show or fluff to dilute the heartache and struggles they convey that give you a sense of camaraderie with the band that most other outfits just can’t hack. Absolutely love this release and IMHO it is the best thing I’ve heard in 2016. My only beef here is that it should be rated higher than a 7/10. Thanks for reviewing though. These guys are making honest music and I can’t wait for my order to arrive so I can turn my band mates on to them. I like the old stuff like “Suns work undone” and “Alabama shamrock”. I partied with the hackensaw boys in a hotel room in middle Wisconsin a long time ago and none of them looked like these guys. Sounds like it was a hell of a party. Seriously though, the band has had a bunch of turnover like I said above. Probably only one or two members still exist from back then. Dave Sickmen(on the left) wrote and sang both of those songs. He quit the band for several years so maybe you saw them then, but those are his songs. Yeah I couldn’t even tell you the year that was but I’ve seen them several times and it’s always been a hell of a show. We first saw the Hackensaw Boys at Ram’s Head in Annapolis, MD – had no idea who they were – just decided to check out their version of Bluegrass music. Loved it and them! Found out they were going to be at the Spring Pickin Bluegrass festival the next Spring and rented an RV and had the best 4 days in the cold and rain. We were hooked on progressive bluegrass! Bought an Airstream and GMC truck and took it to the next Spring Pickin Bluegrass festival, which they sadly weren’t playing at. Caught them again at AMP Strathmore and Rams Head and will be seeing them again at this year’s Spring Pickin Bluegrass Festival in Biglersville, PA next weekend. know they are still in the ring…..